I have a problem with water in my levels looking cheaper than it actually should be. It looks fine to me after a fresh compile, but as soon as I load it from an other coputer or after packing the map/playing it on a server it shows semi-cheap. The reason we have this version on the server is that I asked Nappa to compile the map himself so I could upload the good water one. So he sent it to me and I managed to upload the wrong one to the forum (and it was "too late" when I noticed it). Anyway, back to my problem. I had a few ideas as to where it could come from. I forgot to pack in the map some specific texture files that should make the water look nicer? That was my first guess. Each time you would think "Yeah, I got pakrat good this time" you get bad surprises. but it turns out that this problem also occurs on stock hl2/tf2 water textures, which everyone should have the texture of it. So its not that. 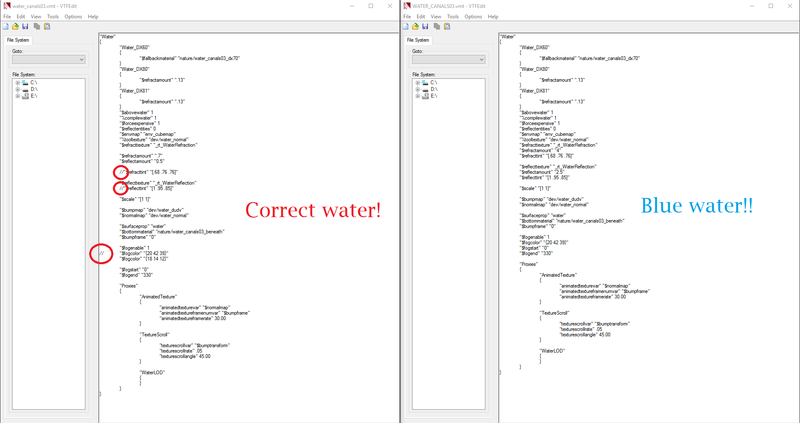 I did configure the water_lod_control entity wrong? That would be really weird: I never ever touch it when manipulating maps in hammer. Plus I tried setting it as high as possible and the water still looks opaque at close range like in the pitcure. I am using vbct to compile my map instead of the built in Hammer compiler (like God Damnit Nappa does)? That wouldn't cause the issue right? its litteraly using the same .exe files at the same folder locations to compile the maps. The way water is being procedeed shouldn't be different. And I went ahead to try and it indeed still looks slimy after a hammer compilation. I am always compiling maps in Final vrad instead of full? The issue also occurs on a Fast compile and full, so I think that its completly unrelated to that too. I am compiling the wrong map file? Wrong. I litteraly gave God Damnit Nappa my map file for him to compile. No edition was made but we both had different water. There is a leak in the map? Nope. No pointfile is being generated when I am compiling any of the maps I have. I am using the wrong dx_level? I use 95 and from what I read, this is the highest it can get. 90 should be enough to render good water. Plus The two screenshots you saw were taking just by switching maps, not by touching any weird game settings. Is my water following the requirements in order to display expensive water? Yes. You can't see it on the previous screenshots because there are multi-leveled water surfaces renderes at once, but even when it does it still doesn't look fully transparent. I didn't build the cubemaps? Its just an overlayed pre-computed reflection texture put on the water's surface. It has nothing to do with the way the core water behaves. Is my water brush being crossed by a func_viscluster brush? (basicaly makes vvis say that there is no water surface between the air and the water volume). No. 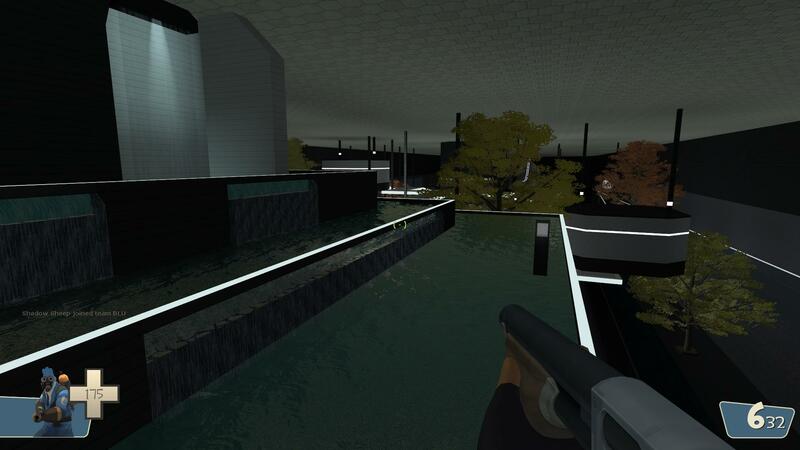 I used to have that on bhop_arcane_v1 and the water looked more like a Hall of Mirrors effect than just cheap water. I have a vertical surface of water applied to the brush? Nope. Not in most cases at least. It doesn't break anything doing that anyway as far as I can tell (look at jump_toxic_v6). So yeah, I really have no idea what causes that to happen, but i know it does that for every compile I do and will do later, so i guess I should probably have that sorted out as soon as possible. Last edited by Shadow Sheep on Tue May 17, 2016 2:04 pm, edited 1 time in total. Turns out it was happenning on only one texture, but that this texture was used in a lot of maps I ported: nature/watercanals03.vmt. Which explains the blue-ish for water and the weird opaque effect. surf_crzyfrog_fix, surf_elysium2, surf_fruits_fix, surf_lt_unicorn, surf_Syria_again_njv and surf_twillight_njv. So yeah, when you port maps and notice that the texture doesn't behave the same after you have packed the map, double check if the .vmt didn't override an existing hl2/tf2 texture. I had this problem just now on surf_legendary_fiw where none of the glass were reflective even though it was a default hl2 texture. It was because I had in my folders a glass file with the same name that told the game there was no reflection, and that pakrat packed up after scanning. People in-game will load the packed file first aparently and so will miss the reflective effect. I assume it's mainly based on the fogcolor, which is the color the fog turns into when you go under it...since you had the reflection set pretty high on that, it reflected the fog of the underwater so all you saw was blue. The refraction I don't think is much of an issue, because refraction is exactly that....bending light to give it the affect of wavy water.